alaTest on kerännyt ja analysoinut 147 arvostelut tuotteelle Sony Handycam HDR-PJ275. Keskimääräinen antama arvosana tälle tuotteelle on 4.4/5, verrattuna keskimääräiseen arvosanaan 4.0/5 kategoriassa Videokamerat. Me analysoimme käyttäjien ja ammattilaisten antamia arvosteluita, tuotteen ikää ja muita seikkoja. Verraten muihin tuotteisiin kategoriassa Videokamerat, Sony Handycam HDR-PJ275 on saanut alaScore™-arvosanan 86/100 = Erittäin hyvä. It's a fun little camcorder, very lightweight. My kids will love the built in projector. this is a great camcorder! I use it for capturing sporting events my kids participate in. 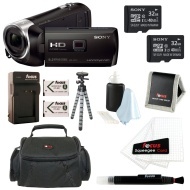 This camcorder is easy to use, and captures wonderful images. As a bonus it has a projector which works very well. This is a nice camera with good features. I returned another to buy this one because of the internal memory and the projector. Good deal with open box and great camera. My sons love it. They can record their activities then play on the wall at night.